Lets you choose the custom fonts (both the variable and fixed width) that should be used to display the contents of the files with the internal Quick Editor. Lets you specify the default type of the files created when you use the New command of the internal Quick Editor. 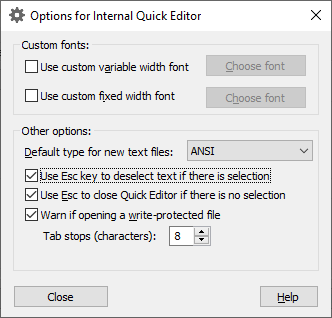 If selected, this option lets you press the Esc key to close the currently open window of the internal Quick Editor (which would have the same effect as the Close command). If selected, this option causes AB Commander to display a message if it detects that the file you are opening with the internal Quick Editor if write-protected. The message may prompt you to restart AB Commander as administrator, or to simply warn you about the situation, if AB Commander is already restarted as administrator. If you clear this option, then AB Commander will not display such a warning. In any case, AB Commander adds the text Write-protected to the title bar of the Quick Editor window if it detects that the file is write-protected.